The James Beard Foundation is inviting chefs nationwide to participate in the Blended Burger Project. 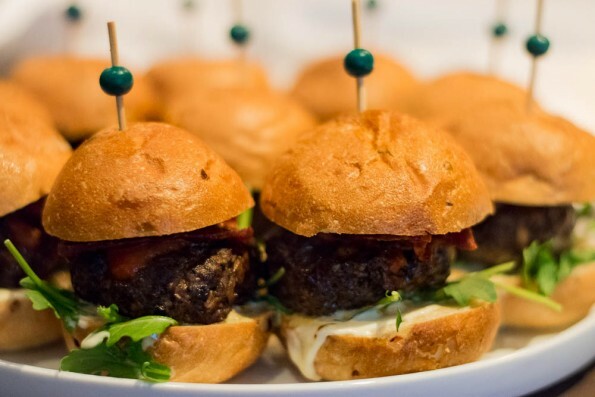 The Blended Burger Project is an initiative to drive attention to ‘blended burgers’ – that is, burgers made by blending finely chopped mushrooms with meat for improved flavor, nutrition and sustainability. Even the chefs at the Culinary Institute of America have been helping to educate their chefs on the concept of Blending and the Blend has been called “the future of food” by The Culinary Trust. The Blended Burger Project asks chefs to create a burger recipe that uses at least 25% chopped mushrooms. It can be any meat and any mushroom. With mushrooms being considered a miracle crop due to the ease in which they grow, the small space needed to grow them. By using the blend, chefs can also cut costs and add more flavor. We recently attended a kick off event for the Blended Burger Project. We tried burgers by Bernie Kantak of The Gladly, Gio Osso of Virtu and Stephen Jones of The Larder + The Delta. Each chef did a different take on the blended burger. Chef Bernie used ground chuck, shiitake mushrooms, chorizo jerky, and bone marrow aioli. Chef Stephen’s take featured ground short ribs, “lots of red wine”, shallots, calabrian chiles, caramelized onion and mushroom jam, and a mushroom mixture that featured portabello, shiitake, and more). 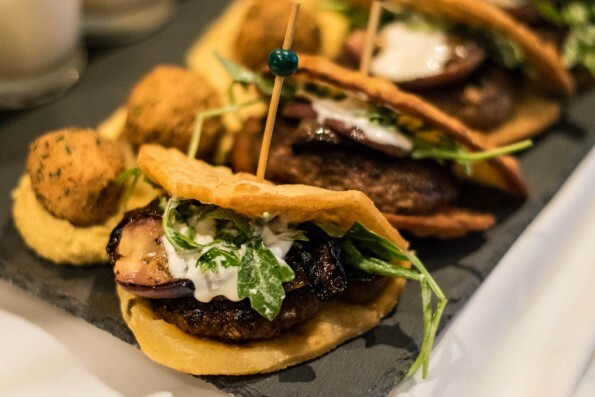 Chef Gio’s burger was different as he took a more Mediterranean style and used lamb mixed with several different mushrooms including shimeji, chanterelle, shiitake, and bluefoot. It also had a gingered honey yogurt sauce, Moroccan spice, minted eggplant, and charred red onion. The various burgers were outstanding! The added mushrooms made the burgers juicier and far more flavorful! We really hope to see more chefs in the valley participate in this! We are already thinking of our own ideas for a blended burger! We’d love to hear your ideas for a blended burger! Leave your comment below or use the hash tag #GeekEats.